President Barack Obama and his twin enjoy rock 'n' roll drag racing. At least they appear to in a new claymation video for singer Neil Nathan's new song "Jumpstart" which was posted on YouTube earlier this week. The video, which clocks just under two minutes, begins with the caption "Welcome Race Fans!!! Today The Obama Twins, Hope & Change, Face Off." 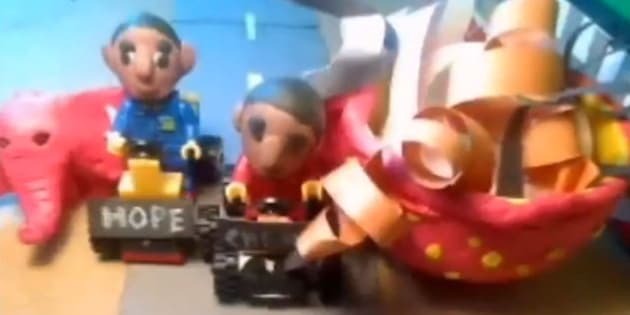 From there the two claymation characters are each shown in a different Lego-made vehicle, one named "Hope" and the other named "Change" with a picture of Obama and the phrase "Forward" shown after the starting line. With a claymation figure in a cape dubbed "Super Bill Clinton" waving the checkered flag to start the race, both vehicles are shown going down the raceway before they encounter their first obstacle: "Fearless President Putin On The Loose." The Putin character tries to chase down both Obamas before he crashes. The next obstacle Hope & Change face is a claymated Iranian President Mahmoud Ahmadinejad with a nuclear bomb nearby. "Oh No! It's President Ahmadinejad & He's Got A Nuclear Bomb!" the caption reads before the Iranian President hops on the back of Change's vehicle with bomb alongside him. Fortunately another claymation figure — this time Israel Prime Minister Benjamin Netanyahu — uses his own bomb (with the Israeli flag on it) which causes Ahmadinejad to fall off the back of the vehicle. From there, the twin Obamas meet German Chancellor Angela Merkel driving the wrong way in "The Euro-Mobile," which the twins safely avoid. Then the cars run into a giant cup and a elephant resembling the right-wing Tea Party — the Republican Party's trademark animal and a symbolic representation of the Tea Party, respectively. Both the elephant and the cup slow down the vehicles, but thankfully China's General Secretary Xi Jinping and "His Gang Of Dragons" come to rescue the twin Obamas from the elephant. Finally, coming down the stretch "Super Bill" saves the day again, tossing the tea cup aside to let both Hope and Change finish the race in a dead heat. "It's A Tie! Hope & Change Win The Future!!!" the caption reads as Super Bill holds hands with the twin Obamas. According to the closing credits Nathan came up with the idea but got valuable help from claymator Dawn Marie Nabong and assistant claymator Ricardo Camoro. The song is from Nathan's new album entitled Sweep The Nation.